Preferred Habitat: Bare ground or short grass near brushy areas or prairies. Seasonal Occurrence: Uncommon in all seasons; permanent resident. Population Status: The Lark Sparrow used to be common throughout the continent but it is now scarce in the eastern half of the United States. The National Audubon Society lists it as one of the "Top 20 Common Birds in Decline". The report may be read on their web site. The report states that Lark Sparrows have declined by 63% since 1967. Profile by Glenn Olsen: This is one of our most handsome sparrows. 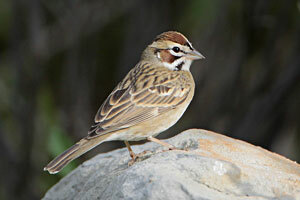 The bold facial pattern of the Lark Sparrow gives it a distinctive and colorful appearance. The whitish head is accented with chestnut lateral crown stripes, chestnut ear patch, and a prominent black malar stripe. The upperparts of the back are typical brownish gray with darker streaking, but the underparts are white to bright white and unstreaked with a central dark breast spot. A very handsome bird! The long, round-ended tail is trimmed in white along both sides and flashes white when the bird is flushed from the ground. This distinctive feature can aid in narrowing your choices in identification but is not conclusive, since other birds, like longspurs, juncos and the Vesper Sparrow, also have similar white tail trim. Size-wise, the Lark Sparrow ranges toward the large end of the sparrow spectrum, but is still much smaller than a mockingbird. The primary breeding range for this sparrow is the central two-thirds of the United States and southern Canada. Lark Sparrows prefer open habitat like grasslands, agricultural land, fields, pastures, and other areas that are open with scattered trees and shrubs. Females build a nest in a small tree or shrub or in a small depression on the ground, usually near a clump of grass or a low-growing plant for shade. We are fortunate to have some Lark Sparrows in our area throughout the year, but we have greater numbers in the winter as northern birds migrate south. To find this species, I suggest traveling west to the Katy prairie area and into Waller County. Look for this bird in short grass fields and pastures, along the roadside, in ploughed fields, and even perched on fence wire or in small trees.